Home » Free » Temporary » Frappuccino- Sip Sip Go! 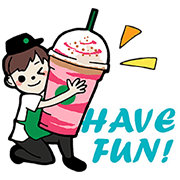 http://www.line-stickers.com/ – Frappuccino sip sip go Line Sticker | Frappuccino sip sip go sticker. Join us enjoy starbucks’s summer flavors without limits! Available till August 25,2015.Just buy Frappuccino- Sip Sip Go! flavor and get serial number for free download. Publisher : President Starbucks Coffee Corp.
Next post We love SG50!